Sometimes, there is a reason that a standard is in place – with the Bemis 5000 you get the most standard toilet seat you possibly could have. 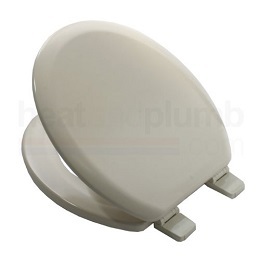 It’s the usual colour, the usual style and it fits just about any standard toilet seat. It’s solid, it’s pretty effective and it looks good enough to suit – so if you want a standard toilet seat at a standard price, we would happily recommend this toilet seat. Sometimes you just want to get the guarantee of long-term quality – this toilet seat will last you quite some time and then you have something excellent that is going to be a fixture in your toilet. When you are trying to put a home together you want reliability over class at times and it’s especially true with this toilet seat! Perfectly able and well-priced, this would be the perfect choice for anybody looking for a quality toilet seat that is just going to tick all of the boxes but offer nothing above and beyond the call of duty.